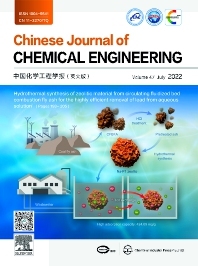 The Chinese Journal of Chemical Engineering is the official journal of the Chemical Industry and Engineering Society of China and published by the Chemical Industry Press. The aim of the journal is to develop the international exchange of scientific and technical information in the field of chemical engineering. All manuscripts with significant research results in the areas of chemical engineering and its application are welcome. Four types of papers appear in the journal: Research Papers, Research Notes, Chemical Engineering Data and Reviews.